What is the best hairstyle for you? The one that is easy to maintain? Or the trendy one? Neither. The perfect hairstyle, above all, works with your particular face shape and appearance as a whole. In the connection hair style – appearance, harmony takes toll over contrast. A sports chick with an intricate bun or an elegant lady with daringly wild hair – both extremes, which have a more repulsing rather than extravagant effect. But while the solution to these two is rather simple (whether it involves a change of clothing or the hairstyle itself), a hair cut is far more permanent. When choosing a hair style you should always consider whether or not it will suit your face shape. The basic rule that applies is: The sharp and angular features of the face should be covered and not emphasized. The characteristic of this type is that the face is as wide as it is long. The features are soft with no sharp edges. The short and voluminous hair styles fit best as they slim the face and the cheeks appear smaller. Two good choices would be: the chin length straight hair with a fringe and face framing tendrils or the one-length curly hair without a fringe. If you insist on keeping your hair long, again, there are two possible hair styles – with side parting or an asymmetrical fringe. Oval face shapes perfectly in proportion with features nicely balanced: with a narrow forehead, wide cheekbones and a small chin. Volume is the most important element of a hair style with this face type. Women with natural curls are truly lucky. Simply apply some hair gel to the ends and put a hair-clasp on the top to finish your hair-style. The straight chin-length hair looks best if parted on the side with ends flipped out. As for the long straight hair – it will look perfect sleeked back. This face type has a broad forehead and a strong square jaw line with visible edges. In this case you should opt for an asymmetrical style with a soft look that will slim down the widest points of the face and help rebalance it. Hair with big waves will look gorgeous. The fringe can be long and thick and the ears should be left visible. Another good alternative would be to pull back the hair into a high pony tail. The small chin and wide forehead are typical features of the triangle face type. Many hair styles go with this type and most of them are quite easy to be done. To help balance the difference between the narrow chin and the wide forehead, opt for a one with chin length then sleek back your hair and use hair-clasps to hold it behind the ears. Flip out the edges, using hair gel. The triangle face looks best if there is no fringe. The side parting also looks nice, as well as wavy hair, which narrows around the neck. Don’t forget that this reflects your personality. Why shouldn’t it be perfect? Tender care for the wavy hair. 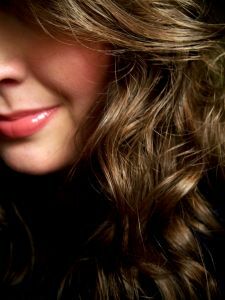 Many women tend to overlook these specific characteristics of the curly hair and purposefully try to change and “tame” it until it is ruined. Hair straighteners, wax, frequent re-coloring, and daily washing – all of these cause hair damage that is practically inevitable and can turn you into victim of your own vanity. Women are inclined to undervalue their natural look and always strive for another aesthetic image, which most often proves to be destructive to the appearance. “Hair-style and hair-color don’t depend on fashion trends, as they are a lifestyle”. “Dress down” and don’t be ashamed of your naturalness. Instead of following all vagaries of fashion, try and find the image that best suits your personality and doesn’t go against your “natural looks”. In order to feel comfortable “in your own hair”, follow these simple tips: re-discover wavy hair, learn how to properly care for it and you will fall in love with your loose curls.